Time flies and so do airplanes fly. I came to Miri on the 29 of February 2008 and today, 24 November 2008, will be the day to wish bon voyage, just for 2008. I spent the whole afternoon till evening for my huge nap, purpose is to avoid falling asleep at the following night. 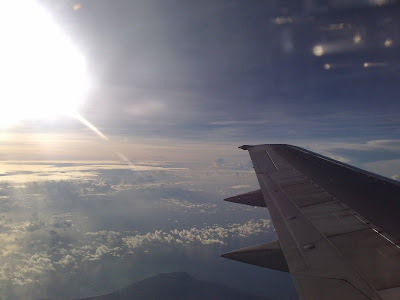 And well, everything went well as what I planned, which was not to sleep the whole night, as I got to wake everyone up at 4am, to send me to the air-port to catch up the first morning flight to KL, 6.20am depart. While I was surfing the net about 3am, omg, hope it won’t rain, because some sparkling lightning and light thunders began to growl. All the way till 4am, and guess what, yupe, no rain, and me, the alarm woke everyone up. Slowly before I leave my last few footsteps, I began to wish good-bye to everything, yupe, everything! Initially 3 tickets were booked via online including mine, but at the end, plan has changed and 2 flight tickets will be burnt. At the air-port, all 3 tickets were checked-in but only me, alone, will be on board. As I walked to the Boeing 737-400, my heart felt extremely heavy to leave Miri, and I told myself to wait for 19 of February - I will be back. 1 young air-stewardess approached to me and led me to my seat, thanks ya. 10 minutes were delayed due to the absent of the other 2 passengers who were checked-in but did not appear on board. Yea, it was my relatives. And so, I had to explain to the air crews. No apologise has been made by me due to the flight delay. Guess I have to sleep in this 2 hours and 10 minutes journey, but yet, nope, I only managed to fall asleep for half an hour. The rest of the time, I spent it on observing the white cotton wools floating in the sky – clouds. While breakfast was served, 2 choices were there, only choose 1, omelets or nasi lemak, oh well, omelets has been taken by me. Then, “which would you like sir, orange juice, tea, milk or coffee”? I picked orange juice, although there were 1 small container of orange juice was served with the omelets. Juice maniac? 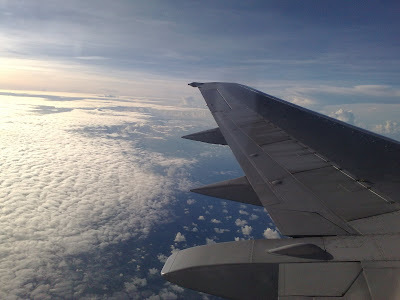 Then, electronic gadgets were allowed to use in the plane, and so, haha, few pictures have been taken by me. The expected 2 hours and 10 minutes journey passed like nothing, the 10 minutes delayed have been covered and reached KLIA at 8.30am, as calculated. Without any further delay, 32kg baggage taken by me and I approached to my 3 closest, craziest, marvelous gang in KL, they were already there waiting for my arrival. So and so, home sweet home, the craziness of KL will be begun shortly.